Prep time: 30 minutes; Bake time: 45-50 minutes. 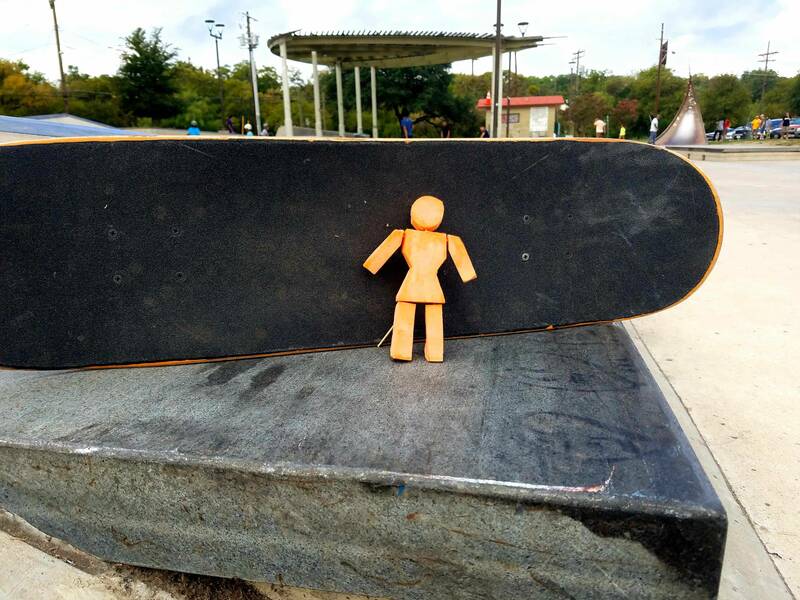 There are certain milestones in skateboarding that almost every skateboarder remembers in perfect detail: the first board you ever had; landing your first kickflip; your first non-Payless pair of skate shoes. You get the idea. Among those common mile-markers firmly embedded in every skater’s memory is their first Crailtap video. This is not surprising, considering that Crailtap’s calibre of team and production values have always been sky-high. Often paired with the creative license of skateboarding’s artistic guru, Spike Jonze, Crailtap’s films have not only pushed the envelope in every aspect of mind-blowing skateboarding (whether it be flip-in/flip-out madness, gaps galore, or miles-long rails), but in cinematic genius, as well. Seriously, do I touch on the green-screen hilarity of Yeah Right, watching Pappalardo bail into a million pieces in Fully Flared, or Mike Mo’s earthquake-inducing frontside flip in Pretty Sweet? Not only does each Crailtap video explore the depths of humor and cinematography in skateboarding, but each is also a superlative execution of skateboarding’s current trends. Boil the Ocean may have said it best in the beginning of its review of The Flare: “What if you’d been told, on the occasion of Fully Flared’s premiere nigh ten years ago, that Anthony Pappalardo’s part would provide a primary guiding light for the shoe supplier’s next full-length video—would you have believed it?” While the standard of what constitutes a skate video may be radically different every five years, it’s undeniable that Crailtap is always ready to surf the ever-changing tides with a top-notch collection of footage. I chose to single out Pretty Sweet for this recipe not only because it’s a gnarly pun, but also because Pretty Sweet may have been Crailtap’s high-water mark for footage of skaters over 30. While there were morsels from Rick Howard and Mike Carroll interspersed throughout The Flare, Jeron Wilson, Brandon Biebel, Kenny Anderson, Mike Carroll, Eric Koston, Guy Mariano, Brian Anderson, Gino Iannucci, and Marc Johnson were all over 30 when Pretty Sweet came out, and most of those guys had at the very least half a part, if not a full three minutes. You don’t have to be pushing 30 to already be painfully familiar with the anthem of creaky joints that plays during your warm up. The more you skate and the older you get, the more susceptible your joints are to aggravating inflammation. While there’s always the option of choking down some ibuprofen every morning, a diet rich in foods with anti-inflammatory properties is a healthy, natural way to fight inflammation. 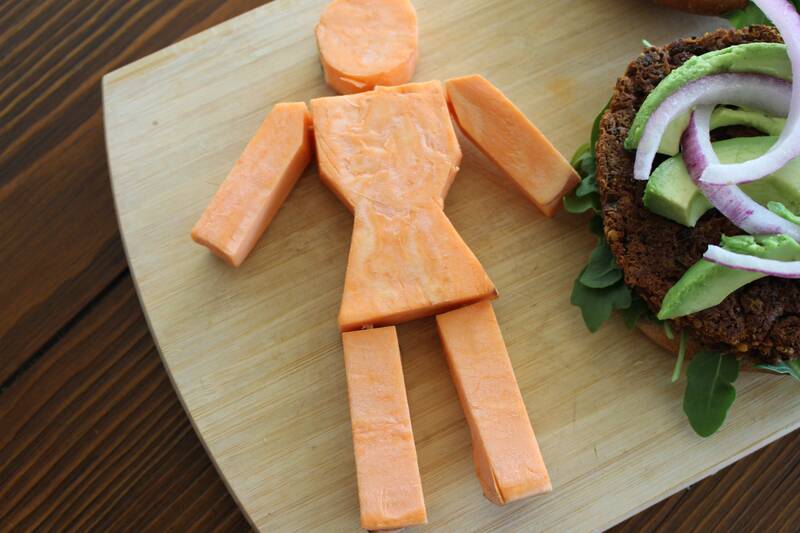 I present to you… Pretty Sweet Potato Burgers. I think we can all agree that nothing quite hits the spot after a session like a fully loaded burger (Clive Dixon gets it). 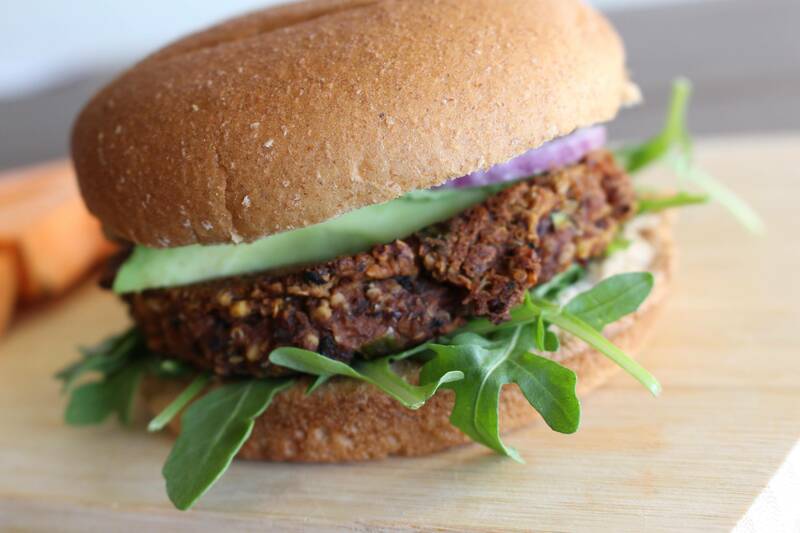 Thankfully, these sweet potato and black bean burgers will not only complement the session’s triumphs in the way that only a burger can, but they’ll also help keep you agile and limber for the next session. Though the public sings its praises largely around Thanksgiving, or when it’s in french-fry form, sweet potato is an excellent source of vitamin A that’s available all year long and can easily be incorporated into almost any recipe. As one of the most effective inflammation fighters espoused by traditional athletes and skateboarders alike, it’s no secret that making sweet potatoes a regular part of your diet will work wonders for your aging knees, hips, and wrists. Furthermore, sweet potatoes are lower on the glycemic index than regular potatoes (meaning they don’t lead to a spike in blood sugar) and are high in fiber. Whether it’s your joints or your (*cough*) plumbing, they’ll keep things moving. 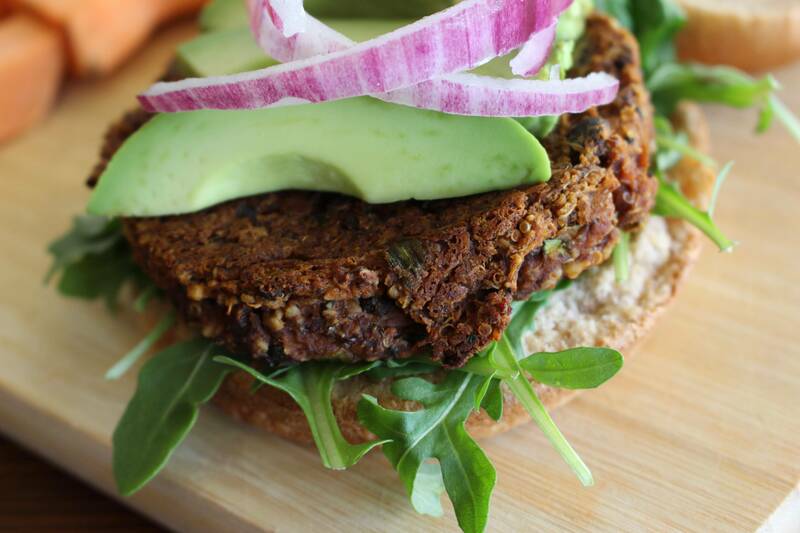 Additionally, these burgers throw in black beans (for some extra fiber and magnesium) and quinoa (for some extra slow-digesting carbs and complete protein). Top this off with some complements, like some greens and avocado, and you’ve got a balanced post-sesh meal that will fill you up without weighing you down. Ready to ease that joint pain while stoking your taste buds? Let’s cook. *You can sub rice for quinoa, any kind of nut meal for oats, and chia seeds for ground flax seed, if you prefer. I looked at (and tried) a few different recipes in making these, including The Minimalist Baker, Isabel Eats, and Happy Healthy Mama, and each had minor variations of the above. First, preheat the oven to 400°F and prep that flax egg. To make the flax egg, add 3 tbsp. of room temperature water to 1 tbsp. of ground flax seed. Whisk it up with a fork and then let it sit in the fridge for 10-15 minutes until it takes on the gooey consistency of an egg white. Next, cut the sweet potatoes in half length-wise, rub a little olive oil or cooking spray on the orange side, and then place them face-down on a baking sheet and bake them for 30 minutes. While those are baking, start cooking that quinoa. Mix ½ cup of dry quinoa with 1 cup of water in a pot and bring it to a boil on the stove. Once it boils, bring it down to a low-heat simmer and cover. Let it simmer for 15-20 minutes or until all the water is gone. Pour ½ cup of black beans into a bowl and mash them up with a fork (or masher, if you have one). Once the sweet potatoes are done, peel the skins off, throw those in the bowl, and mash them up, too. Next, add the other ½ cup of black beans (but don’t mash them, unless you’re not interested in keeping them whole for texture and visual appeal). Next, add the flax egg, green onions, cumin, paprika, jalapeño, salt and pepper and mix it all up until it’s as homogenous as ground beef, but, ya know, not ground beef. Grab a ½ cup measuring cup and line it with plastic wrap. Pack enough of the mixture in to fill the cup and even it off with a knife. Over a greased baking sheet, turn the measuring cup upside down and pull on the plastic wrap to pop out a perfectly cylindrical sweet potato patty. Repeat until all the mixture is used up (should make 6 ½-cup patties). To flatten them out, turn that measuring cup around, grease up the bottom and then press it down lightly on each of the patties to turn them into flatter discs. Bake the patties at 400°F for 45-50 minutes, turning them over after about 25 minutes (or until firm/crispy enough to flip without them falling apart). Once they’re slightly firm and crispy all over, take them out, throw them into a bun with your choice of toppings, and chow down. 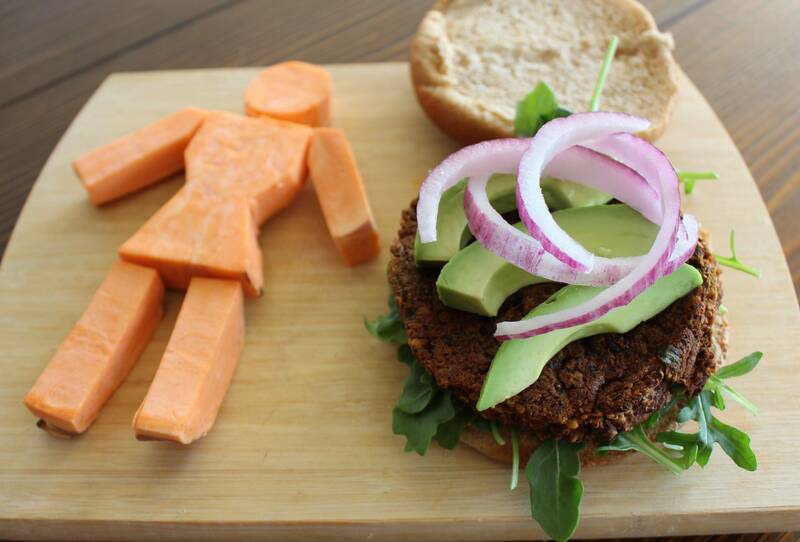 Makes six patties; per patty: 160 calories, 1.5g fat, 30g carb, 6g protein. For more recipes, visit www.saladgrindsandbeanplants.com or check us out on Instagram at @salad_grinds_and_bean_plants. End-of-summer blues got you down? This new commercial from WKND will definitely cheer you up. Jart’s Gustavo Ribeiro visited from Portugal and filmed a Bangin just for you! Elijah talks unfinished business from Vans’s No Other Way. Mikey Alfred is co-producing Jonah Hill’s new movie.